OK so i got to thinking that we all have our favorite retro games but they more often than not seem to be the most popular games from those days. Some classics have sadly been forgotten so i shall be doing some threads for different systems asking you to look into your gaming past and throw up a few underappreciated games.. This one is for the ZX Spectrum. Trap Door was a special for me, i loved the TV series that it's based on. It captured the feel of the series so effortlessly plus Flunky was a character that i loved to draw back then. With its colourful graphics and brilliant puzzles i really believe this game should get more love than it does. Must not forget this was coded by the great Don Priestley. 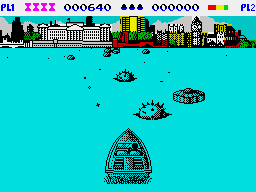 We always talk about Manic Miner and Jet Set Willy, both equally fantastic games but i alway had a soft spot for Dynamite Dan. It was a simple affair, collect stick of dynamite. Eight of them was needed to blow the safe. 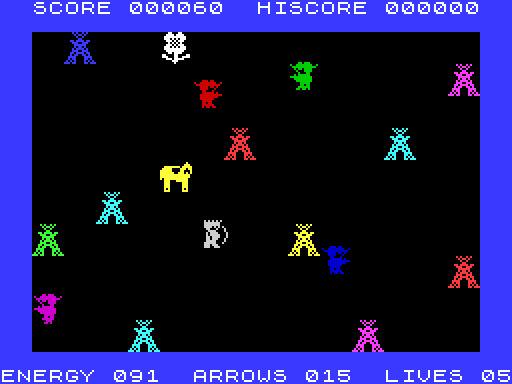 You needed to hunt around to find the dynamite with plenty of enemies trying to stop you. Thats just two of mine, interested to read yours? 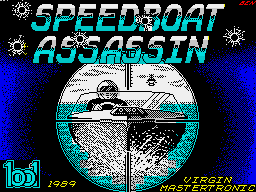 Re: Underappreciated ZX Spectrum games. Great thread! Here are 2 of mine then too . 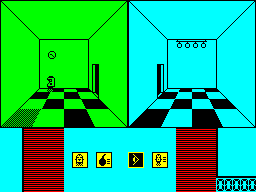 . .
First up is one of the very first Spectrum games I ever played. It's a strategy game by Firebird called Viking Raiders. It looks very simple but is amazingly good fun to play, especially in 4-player mode. You each take control a Viking and must build up an army then wipe out the opposing armies. It's turn based as you can probably guess and has some hilarious features like the way your Vikings can get drunk and then go berzerk! I fired this up in a emulator recently and it was still as fun as ever. 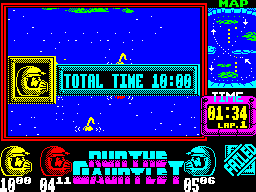 The second game I am going to nominate is Guardian II by budget masters Hi-Tec. This was one of the few games they released that was a cartoon licence and is without doubt their best ever game. It's just a blatant clone of Defender II / Stargate but probably one of the best versions of the game I have played on any machine. It has great graphics and sound, tight controls and perfect gameplay that just keeps you coming back for more. 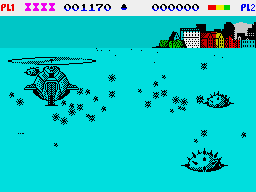 So load up the Speccy or an emulator and give this great shooter a try. 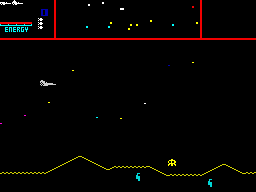 as you say, the look of the game really captured the TV series.Don Priestly also did Mazogs on ZX81 did he not? 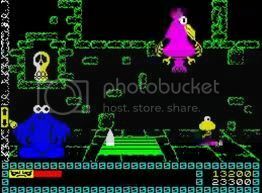 if so, i'm for ever in his debt, blew me away playing that (if ever there was a ZX81 game (for How far we've come...) it's this. 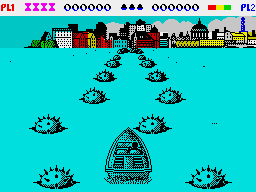 Also recal seeing Popeye in Zzap 64 i think it was, again just looked the part. Ariolasoft weren't renowned for quality and this was on a sub-label of theirs. Tigress marketing came up with the idea, sold it to them and they hired some programmers to "realise" it. You play a team of bomb disposal robots and need to collect the bombs and chuck them out of the nearest window, very safe lol. Later levels were devilish, reversing gravity, controls etc. Graphics lovely, crisp and clean. Couple of great little games that came bundled with my Spectrum and aren't really remembered very well, had hours of fun with these. Both of those games are by the infamous Harry S. Price who simply hacked other peoples games then passed them off as his own. didn't know that...I suppose back then anything and everything was copied with a name change to avoid a lawsuit! In my innocence i still enjoyed them! Great thread idea, Zapiy! Thanks to everyone for sharing their favorites. Nice one all, i don't remember ever hearing of some of those games.. I will make sure to check them out.. Here is another i feel has been under appreciated over time. The Great Escape by Ocean. You control a prisoner in a prison of war camp.. The whole idea is for you to try and espcape, but thereare soldiers guarding the camp, they attack you if you appear to be not following a daily routine. The game is pretty hard from my memories but very very addictive. If i am right this got some great reviews back then also.. So why does this not get much love i wonder? 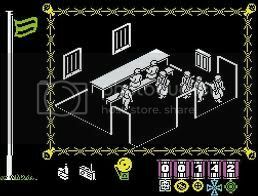 Flip me i forgot about that game fella.. That really was a great budget game..
For me it has to be Brian Bloodaxe (Elite). A blatant JSW clone, but none the worse for that. Another game I love is and still play regularly is Spawn of Evil (dk'tronics). What about Run the Gaunlet.. Played this game for hours myself but yet i hardly hear people talk about it? I used to have that and I do remember it being a lot of fun, IIRC it was based on a TV show. Here is another one for you that I was playing recently, Apache Raid by Pirate Software. This is a funny one because I know the game probably isn't that good but I just love playing it and it brings back a lot of memories for me too. Its a nice colourful game where you basically just run around killing cowboys and collecting stuff.